Posted on June 2, 2017 , in Hot Tubs. If you’ve recently invested in a hot tub, building a deck may be next on your list. Not only do decks create a functional space for entertaining, but they can enhance the aesthetic appeal of your home. Below you’ll learn about the wide variety of deck options and how to make the best choice for your needs, budget, and lifestyle. Even if you choose a stand-alone hot tub, you can still build a deck around it at any point. Many people buy stand-alone models so they can use their hot tub immediately and save up money to build a deck. For a basic deck, consider a “rim deck” design. In this type of deck, a wooden or plastic shelf lines the rim of your hot tub. The deck can be large or small, depending on whether you simply want a spot to place your drinks, towels, and other necessities or if you want enough room to sunbathe or place chairs. When beauty is a top priority, gazebo decks are a fantastic choice. The roof will allow you to use your hot tub in any weather since it will protect you from rain and snow. Gazebo decks are also terrific choices when you want to entertain. Large decks are the way to go if entertaining is at the top of your priority list. You can use stylish furniture that suits your personality, tables, chairs, stereo systems, bars, and plants to create the perfect outdoor oasis for your guests. By adding plentiful seating, your guests will still be able to be part of the group even if they don’t want to be in the hot tub the whole time. At the other end of the spectrum are people who want to create a private, intimate space to share with their loved ones. In this case, a small deck with enough room to place your drinks and towels will be perfect. There are many strong, sturdy wood options you can use for your deck, such as oak, pine, redwood, and cedar. Cedar is one of the most common wood choices because it’s beautiful, easy to maintain and creates a rich aroma when wet. Hopefully you’ve learned some new ways of thinking about how to create the best deck for your hot tub. 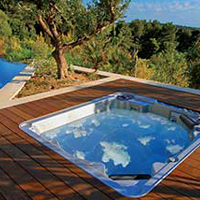 Download our buyer’s guide to see our many hot tub options.